Social media can make or break your brand. It's essential to know when and what to post. Start by conducting industry research and checking out your competition’s social channels. You may be overwhelmed by the number of posts out there and find yourself confused about when you should deploy your own content. That’s why, after analyzing 17.5 million social media posts by 17,737 brands, marketing analytics software provider TrackMaven has released its Best Times to Post on Social Media Cheat Sheet. 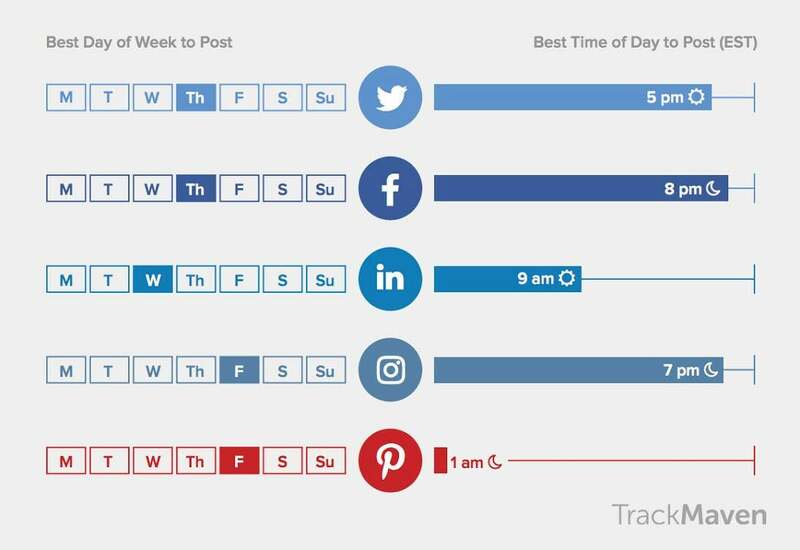 The best times to post vary by industry, channel and target audience. On five of the major social media networks -- Twitter, Facebook, LinkedIn, Instagram and Pinterest -- user interaction peaks at certain times. The report reveals that Thursday at 5 p.m. (all times Eastern) is an ideal time to send out a tweet, while Thursday at 8 p.m. provides the greatest chance of a customer clicking, liking, sharing or commenting on a Facebook post. Fridays evenings are an ideal time to reach Instagrammers, and Pinterest’s peak hour is 1 a.m. on Friday. Unsurprisingly, Wednesday morning is an effective time for a LinkedIn post -- you’re most likely to get in touch with business professionals before they start the work day. The report also examines post times specific to 75 industries. From airlines/aviation to fashion to law, optimal post times differ according to when target customers and followers tend to check their social accounts. In the aviation/airline industry, the best time to post on Twitter is 1 p.m. on Friday -- probably because people are preparing for trips or commuting. For the architecture industry, the best time to send a tweet is on Saturday morning when people have time away from work to think about home projects or renovations. Check out the graphic below to find out what times your company should be posting online, or click here to download TrackMaven's Cheat Sheet for 75 Industries.